I love to decorate my home with dried hydrangeas in the fall! 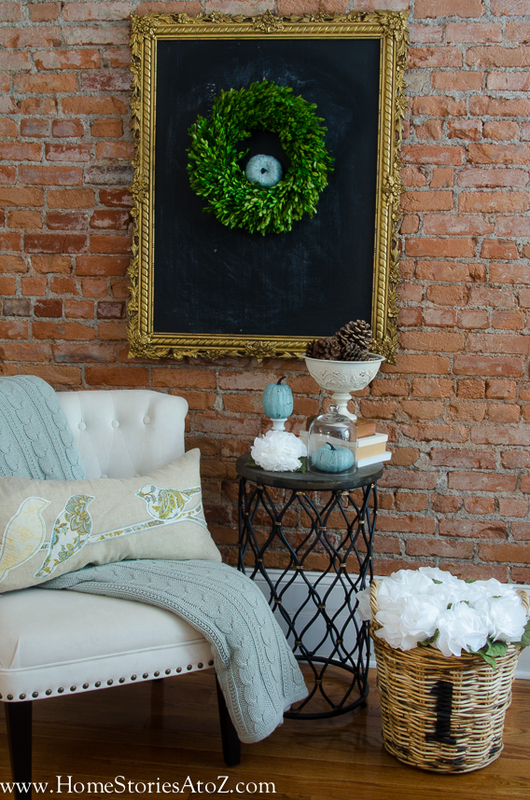 You can see in my fall home tour and fall porch that I used a lot of limelight hydrangeas in my decor this year. But what if you aren’t fortunate enough to have your own hydrangea bushes to cut from? Buying hydrangeas in my area can be quite expensive at the grocery store or flower market. So today, I thought it would be fun to save some money on fresh flowers and create a bushel of paper towel hydrangeas! It’s very easy, and I’ll show you how. Step 1 Paper Towel Flower: Stack 5 paper towels. If you are using custom-sized paper towel, you will need to tear off two sheets of paper towel to create a standard size paper towel. Do this 5 times and stack your sheets on top of one another. Step 2 Paper Towel Flower: Scallop edges. 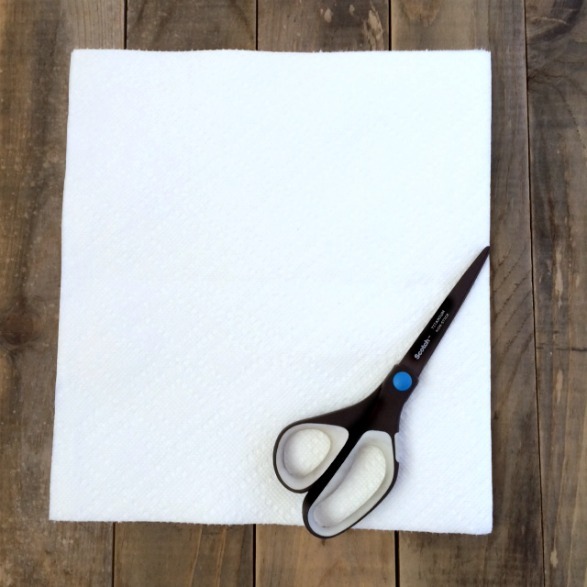 Use your scissors to cut a scallop design around the perimeter of your paper towels. This does not need to be perfect but try to obtain a smooth and rounded edge. 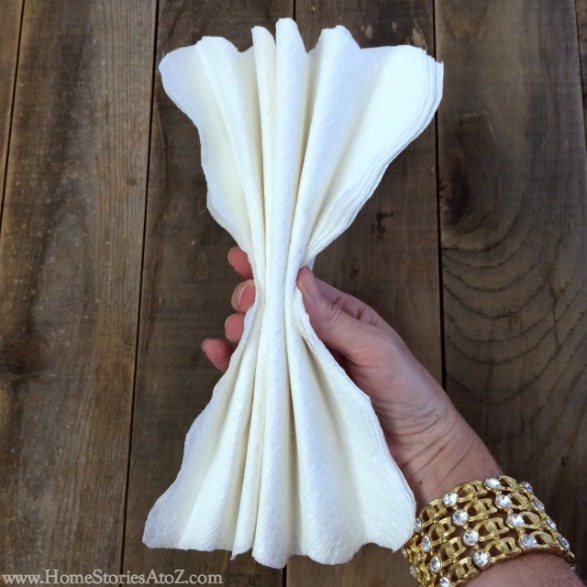 Step 3 Paper Towel Flower: Fold like an accordion. 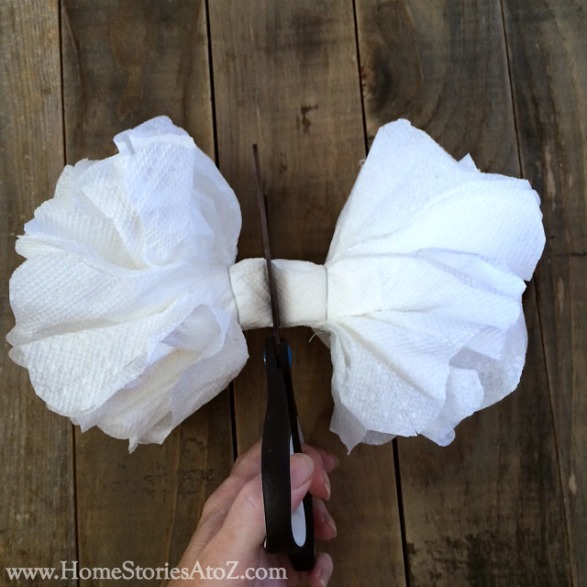 Fold your paper towel as if you are creating a paper fan. You will fold it “accordion style” creating smooth creases as you fold. Step 4 Paper Towel Flower: Pinch & secure. 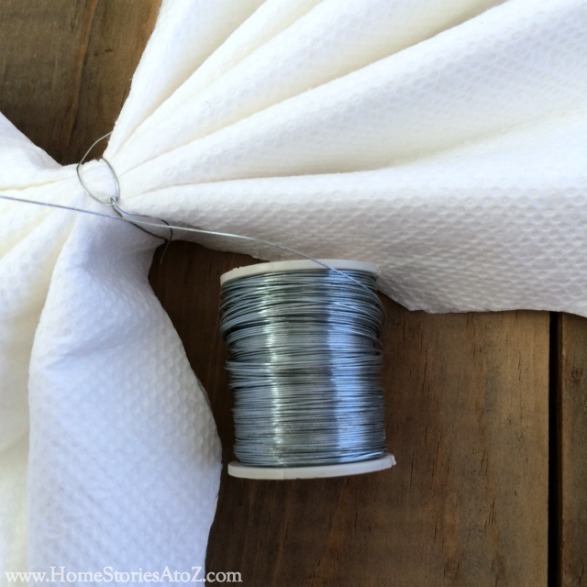 …and secure with floral wire or beading wire. Step 5 Paper Towel Flower: Separate and fluff. Most paper towels are two-ply. 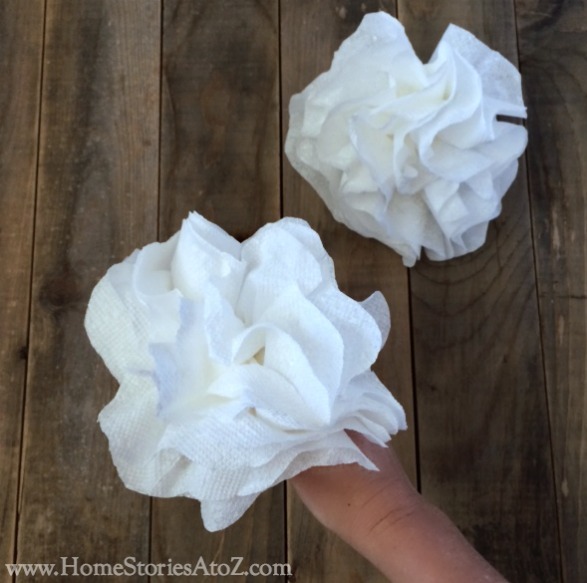 You will want to separate each layer of paper towel carefully to ensure a fluffy paper flower. Do this on both ends of your flower. Step 6 Paper Towel Flower: Secure each end and cut in middle. 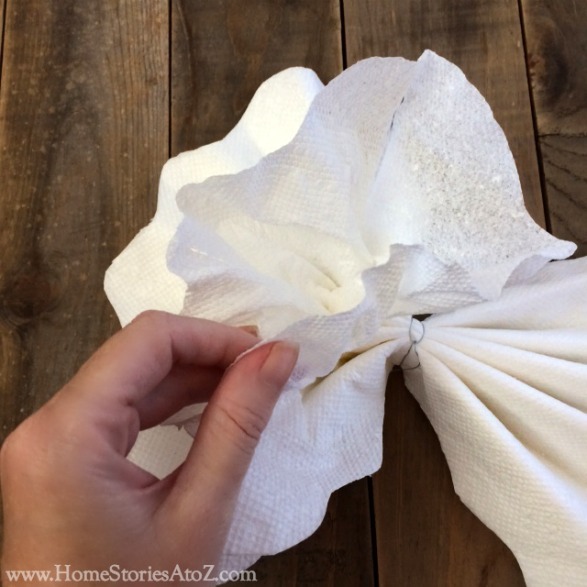 Step 7 Paper Towel Flower: Fluff and enjoy! You did it! 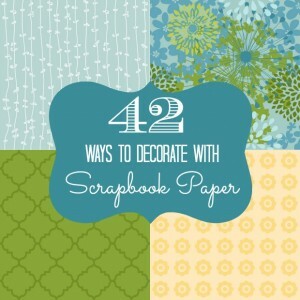 To complete the look of your paper towel hydrangeas glue faux or real leaves to the flower. This step is optional but adds interest to the flowers. 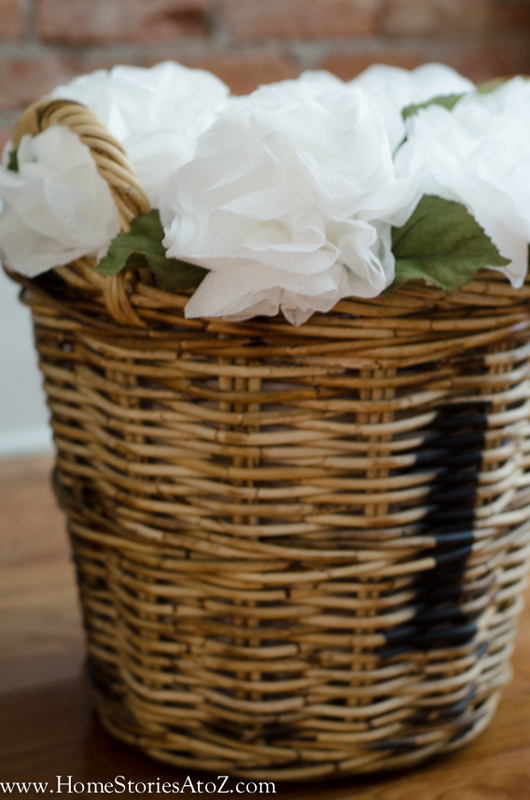 I created enough paper towel flowers to fill a large basket and love the effect. 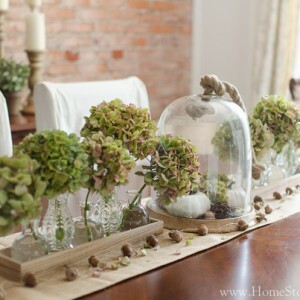 The bonus of these flowers is that when you are tired of them you can use them to dust or wipe down counters. They work great on cleaning bathroom mirrors! 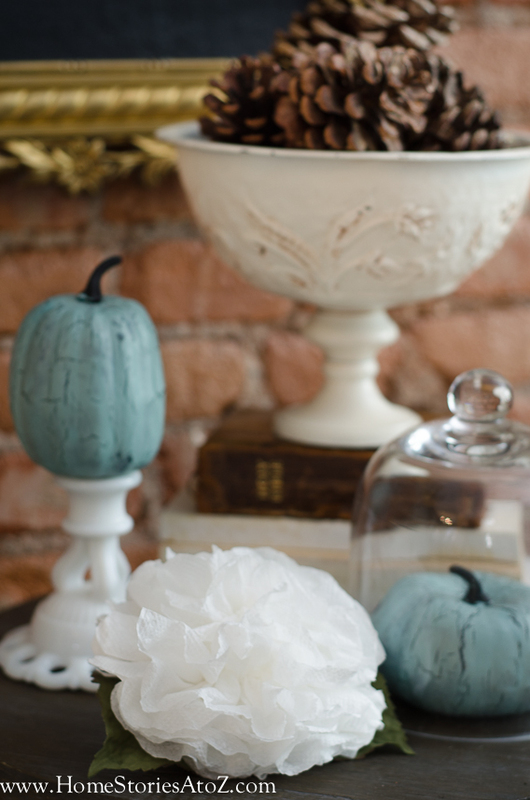 I saved one to show off in my fall vignette and think it looks pretty amazing for a paper towel! 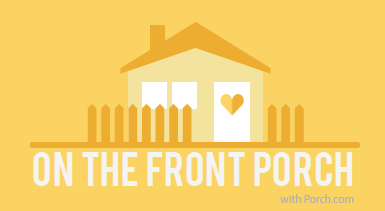 Decorating props and accessories for your home never have to cost a lot of money. 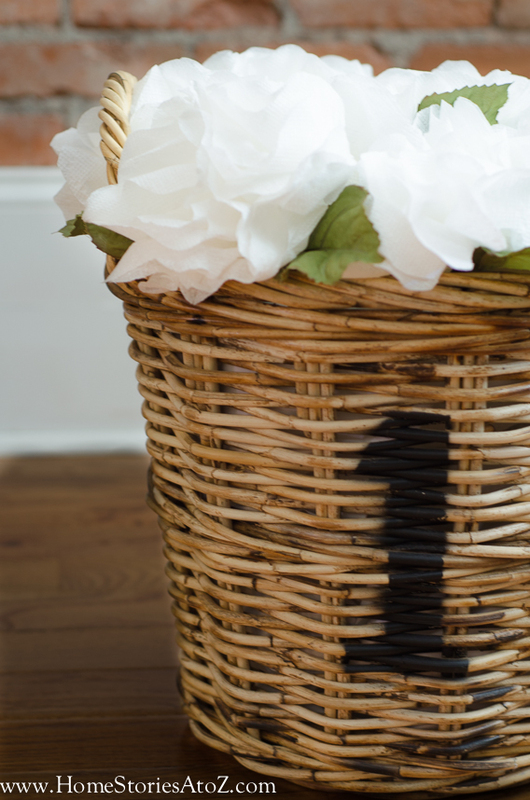 If real flowers aren’t in the budget this month, see if a roll of paper towel just might work in a pinch! 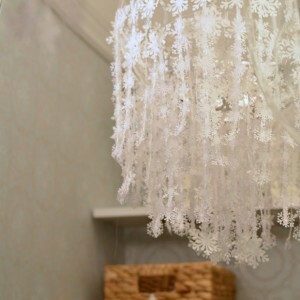 I have made flowers with tissue paper…..white and colored tissue…turned out very pretty too. Wonderful! 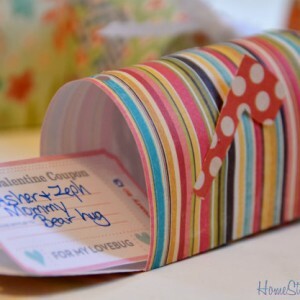 It’s a fun craft to make. Thanks for stopping by! This reminds me of my teen years in the sixties! We used to make “carnations” out of kleenex. I think we used a staple instead of wire because they were small and it worked. After we folded them and secured them and before we would open them up, we would swipe the edges with a pink lipstick. After opening, they really looked realistic! Everything old is new again! 🙂 What a fun idea to create carnations from kleenex! Thank you for sharing! They are beautiful may I add as well. Thank you for sharing! what brand of paper towels did you use? I LOVE hydrangeas! Want to give these a try for sure. Thanks for sharing. Thanks Teresa! 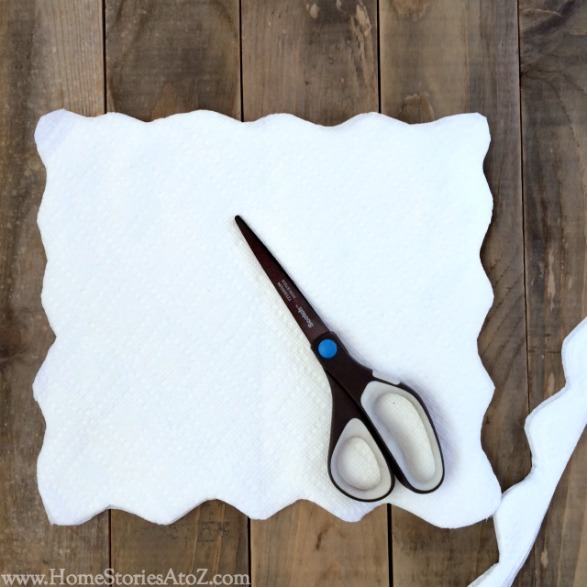 You can use any quality paper towel for good results. Ha! Never doubt. 🙂 Thanks so much Abbey I’m glad you liked them! 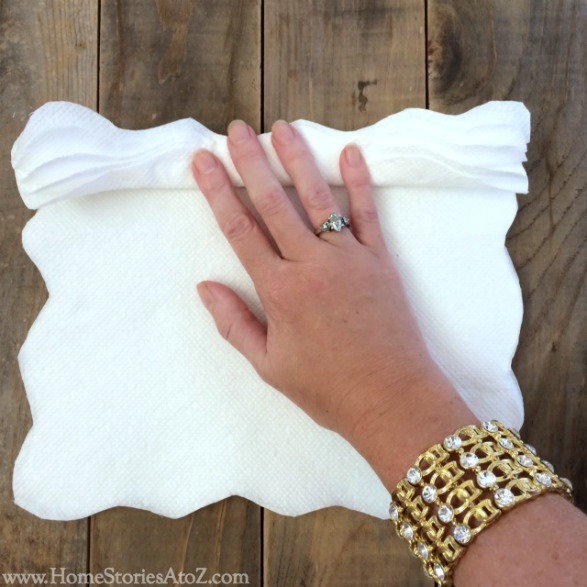 Only you could make paper towels look this glamorous! So cute, Beth & it’s been so fun working with you! Thanks so much for having me on Porch.com today Taylor!